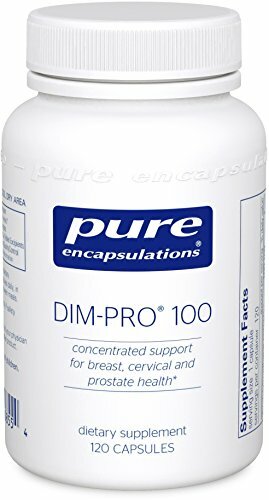 DIM-PRO® 100 contains BioResponse DIM® (diindolylmethane complex). Diindolylmethane is a metabolite of indole-3-carbinol (I3C). Both are found naturally in cruciferous vegetables like broccoli, kale and brussels sprouts. Upon contact with gastric acid in the stomach, I3C is converted to a number of active compounds, predominantly diindolylmethane. Research indicates that diindolylmethane supports healthy cell cycle function and signal transduction to maintain breast, cervical and prostate cell health. In a double blind, randomized clinical trial, BioResponse DIM® revealed potential support for maintaining the function of healthy breast cells. Another randomized placebo-controlled crossover trial found that it promoted statistically significant breast comfort. Furthermore, an additional double blind randomized clinical trial with 52 women found that BioResponse DIM®supported cervical cell health. Diindolylmethane in its pure form is highly insoluble. Patented, microencapsulated BioResponse DIM® has been specially developed for enhanced absorption. This form may be more supportive than I3C in cases of low gastric acidity. If you have any questions about this product by Pure Encapsulations, contact us by completing and submitting the form below. If you are looking for a specif part number, please include it with your message.